Peach tree (Prunus persica): growing, planting, caring. Peaches are delicious - but the care peach trees require is proportionally difficult. 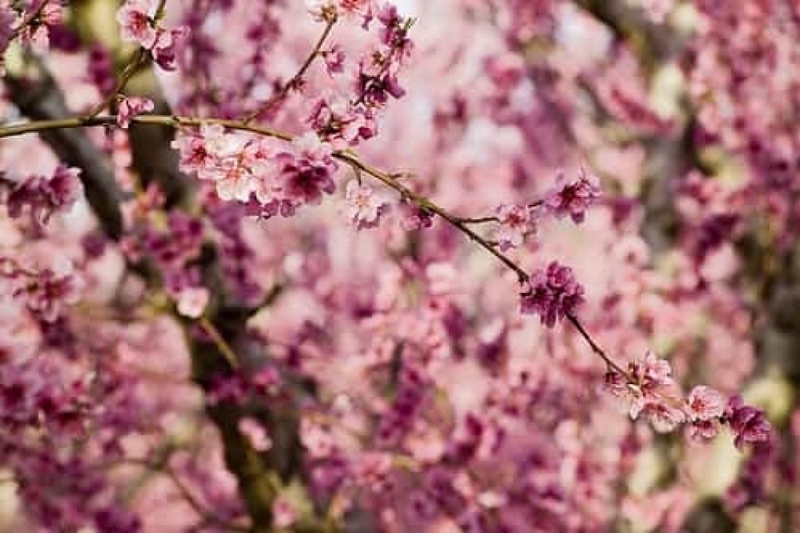 Prunus persica - the peach or peach tree - is a deciduous tree native to the region of Northwest China where it was first domesticated and cultivated.The name persica refers to its widespread cultivation in Persia - modern-day Iran - from where it was then transplanted to Europe. Peaches grow easily around the mediterranean and similar climates, for various reasons. First of all, if the tree itself can usually tolerate low temperatures to around −26 to −30 °C (−15 to −22 °F), they have a chilling requirement that tropical or subtropical areas generally do not satisfy. Another climate constraint is spring frost : the trees flower fairly early (in March in western Europe) and the blossom is damaged or killed if temperatures drop below about −4 °C (25 °F). Then again, climates with significant winter rainfall at temperatures below 16 °C (61 °F) are also unsuitable for peach cultivation as the rain promotes peach leaf curl, a fungal disease for peaches. Finally, summer heat is required to mature the crop. Not living in the riviera but still want to give it a try? Groww is here to help you ! Small deciduous tree, with teethed, elongated leaves, with pink or white flowers in March-April. Plant in light soil, well drained, deep, stony or dry, not too calcareous, in the sun. The bare root planting is done only in winter, while you can plant clumps and trees in container until spring. In bare root, shorten the roots, and soak them in a mixture of water, earth and compost. Plant in a hole at least 20 cm larger than the root ball, gradually putting the crumbled soil back, and tamp regularly around the roots. Water right after planting with at least 50 liters of water that you pour into a hollow formed around the trunk. A stake planted in the hole, inclined, facing the prevailing winds, will be useful, provided you do not forget to remove it later, and use a suitable flexible attachment. If you have no experience of pruning, it is better not to do that! Only tutoring pruning is really needed, to balance the trees. Turn your pruning shears so that the blade is on the side of the part to be kept. Cut down all branches that have produced fruits, after fruiting, as they will dry anyway. Do not trim the first year. Clear the core of the tree, remove the dry branches and those that cross. To optimize the fruiting, leave only 6 to 8 fruits per branch. Harvest when the fruits are ripe, slightly tender to the touch. For the Winter, you can freeze your excess of production by cutting them into 4. Watch for peach blister and for aphids, too. To prevent peach blister, you can hang nets of crushed up-egg shells to the branches. A little compost and mulch or leaves deposited at the base of your peach tree in the fall or early winter will be beneficial.